LEBANON, Tenn. (March 21, 2013) – Cracker Barrel Old Country Store® and Arista Nashville announce the release of Brad Paisley’s Wheelhouse – Special Edition album which will be available on April 9 at all Cracker Barrel Old Country Store® locations and online at crackerbarrel.com and select digital retailers. 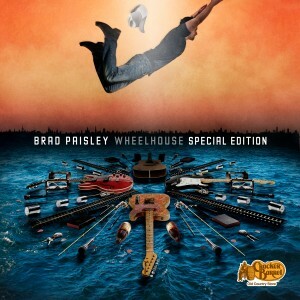 The release includes three additional exclusive tracks and coincides with Paisley’s Wheelhouse standard edition release on Arista Nashville. Among the special guests joining Paisley on Wheelhouse – Special Edition are Charlie Daniels, LL COOL J, Eric Idle, Mat Kearney, Dierks Bentley, Hunter Hayes, and the late Roger Miller. Paisley produced his new album and wrote or co-wrote all 17 of the tracks. Paisley is a critically acclaimed singer, songwriter, guitarist and entertainer, which has earned him three GRAMMY® awards, 14 Academy of Country Music Awards, 14 Country Music Association, three ASCAP Country Music Songwriter/Artists awards and numerous other awards, as well as being a proud member of the Grand Ole Opry. Since his first #1 single in 1999, he has placed 21 singles at the top of the country charts. Paisley’s upcoming album, Wheelhouse – Special Edition, will be released on April 9 and includes the #1 hit, “Southern Comfort Zone,” and his current single, “Beat This Summer.” His 2012 Virtual Reality World Tour played to over one million fans in the U.S. and Europe. His 2013 tour will kick off on May 9 in St. Louis – Beat This Summer Tour presented by Cracker Barrel Old Country Store®. Cracker Barrel Old Country Store, Inc. (Nasdaq: CBRL) was established in 1969 in Lebanon, Tenn. and operates 622 company-owned locations in 42 states. Every Cracker Barrel Old Country Store® location is open seven days a week with hours Sunday through Thursday, 6 a.m. – 10 p.m., and Friday and Saturday, 6 a.m. – 11 p.m. For more information, visit crackerbarrel.com.